This week, I have been feeling enormously frustrated at a lack of progress on a number of fronts, professional and otherwise. To the poor receptionist at the rental car company who wore the brunt of the impatience party that I was the sole guest at – I am truly sorry for my less than stellar behaviour. 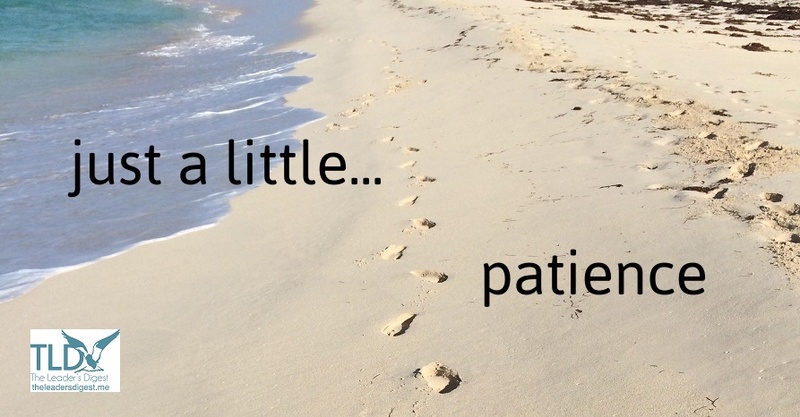 A friend gently and quietly (and ironically, patiently) raised the concept of patience. Not the sexiest little attribute for leaders to cultivate perhaps. But in today’s ‘immediate gratification’, ‘I need it NOW’ culture, the idea of cultivating patience might be worth more than a cursory glance. The pressure for leaders to deliver in the short-term can be uber-present at the very least – and at worst, overwhelming. This short-term, outcome-focused approach is well known in business. And it is acutely felt by many of the leaders I coach. It’s no wonder that the systemically accepted pressure to achieve stellar results by ‘yesterday’ turns us into action-oriented, ants-in-our-pants, finger-tapping managers. We become results-oriented at the expense of other equally valid leadership traits – such as compassion or seeking to understand – expecting immediate and significant progress in everything from performance improvement to product launches to post-merger integration. And it’s not just others we get impatient with. Often it’s ourselves who bear the brunt of this pesky impatience gene. A very talented senior leader I coach recently berated himself for not having “turned around” the division he led yet. It was only when I reminded him that he had only been in the role for six months and that expecting a complete turnaround in performance of an entire business unit in that time might be just a tad unrealistic, did he sheepishly admit he might be letting his impatience get the better of him. Skilled leadership means getting the balance right. Between concrete outcomes and seeing what emerges. Between being hungry for improvement and valuing what progress has been made so far. Between applying pressure and stepping back. In short, great leaders demonstrate patience. Change (especially behavioural) is hard. Customers don’t always act like you want them to. Others are generally trying the best they can, with what they have. Not quite where you want to be with your own journey, whatever that is? Cultivate this quiet but powerful leadership trait. Invite patience and its close friends – persistence and compassion – to join your ‘impatience party’. Look to nature for inspiration – the seasons won’t hurry for anyone! The epilogue to my impatient-laden week? As I sat in Auckland traffic musing on my friend’s wisdom, I came to realise that being patient has hope imbued into its very essence. Being patient implies I will get to where I want to be. It might just take a little longer than I thought. And I’m OK with that.